The first of a 5 city European launch tour, this exclusive event was a private preview of a new car model held at the Rome Convention Centre. The idea was to re-create the atmosphere of an exclusive club setting that was replicable in each major city, this club atmosphere was envisioned as a “Great Gatsby” environment with a mood that conveyed the 1920’s in a modern and current vibe. At the “THE EXCLUSIVE CLUB” guests were transported to what could be New York in the 1920s of another dimension, with soft diffuse lighting, an elegant but serious surrounding filled with prestigious elements in privileged locations. Discover the full concept here. 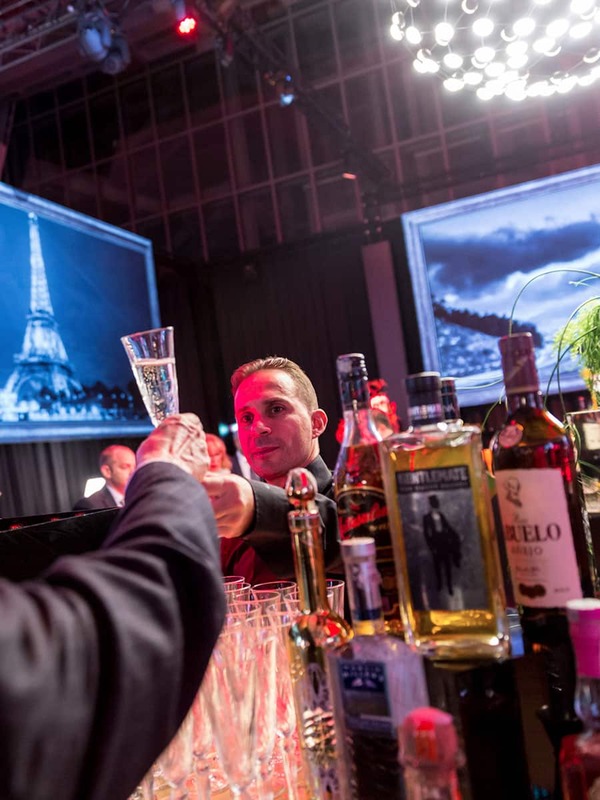 This was the first of a 5-city product launch tour that reached over 2,000 clients in 7 events throughout Europe. 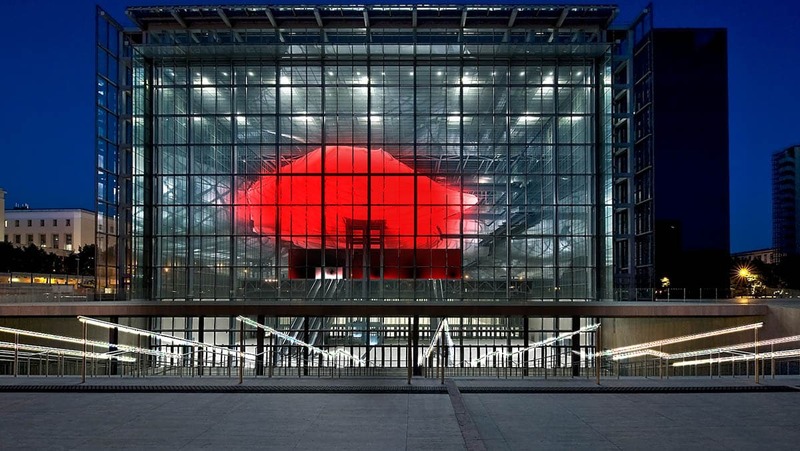 This private preview was held in the ultra exclusive Rome Convention Centre by renown architect Massimiliano Fuksas, in fact it is known as the “Nuvola di Fuksas” or “Fuksas’ Cloud” because the central auditorium features an immense floating cloud in the central foyer, which Genius Progetti dramatically lit for the occasion. Guests were greeted with a red carpet entrance and photo-opportunity with media photographers. They were ushered into the “Nuvola”, where “The Exclusive Club” awaited them with a complete gourmet Italian buffet, multi-media, interactive car reveal show and a custom art deco inspired lounge club. 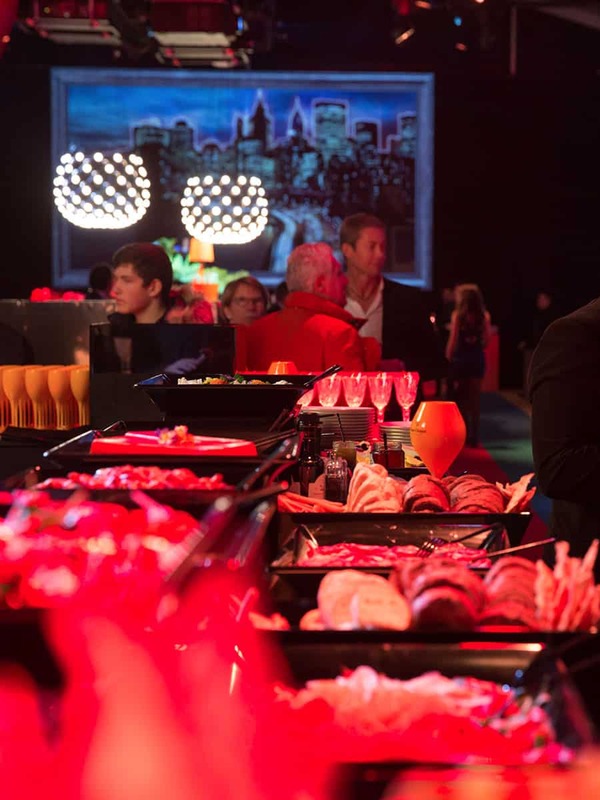 Clients enjoying a full flying buffet by “best in class” Italian caterers. 9 7×4 metre black screens with projections of important international landmarks to create a “window to the world” atmosphere. Bar staff created a custom cocktail for the launches inspired by the new car model and event sponsor. A highly exclusive club atmosphere was created using lighting, decor, and full bar service. Red Carpet entrance to photo-opportunity with media guests and photographers. The entire conception, production, build and management of each of the 7 events in 5 cities was entrusted to Genius Progetti. Video Creation: Creation of choreographic piece, transposed into an animated video using motion capture technology. 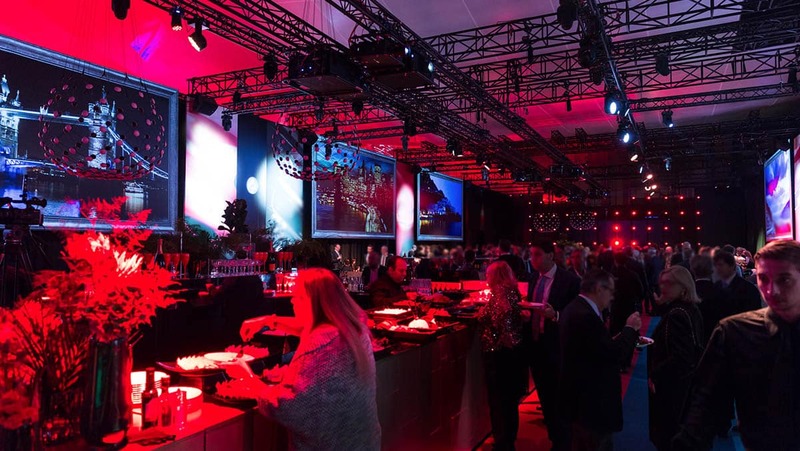 Food & Beverage: Caterer scouting, menu testing and creation, on-site full kitchen (including electrical hook-up, water and exceptional kitchen facility creation). Management of all food and beverage service including wait staff, cocktail and special dietary need requests. Print Graphics: Development of event logo and subsequent printed marketing and signage materials. Front of House Direction & Audio/Visual Managment: Complete set-up of sound reinforcement system and lighting control. Our management includes multiple sound and technical checks and complete technical run-throughs including live event production managment. Client Hosting: Scounting and management of hosting staff, client gift creation and distribution and post-event taxi service managment. LAUNCH CONCEPT: Genius Progetti created and fully developed the concept for this multi European capital private preview, discover “The Exclusive Club” concept here. 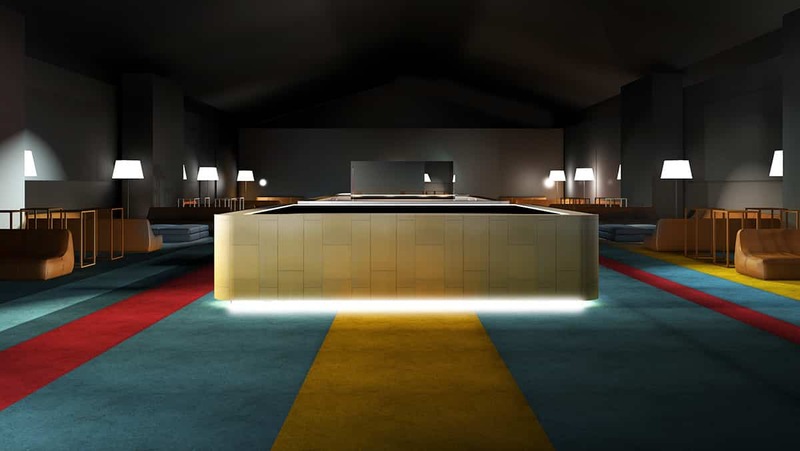 LOCATION REQUIREMENTS: It was imperative that each highly exclusive location was able to house the 1,000 square metre “black box” production space, which was created over the course of a 5 day set-up. FURNISHINGS AND DÉCOR: Custom built furnishing were conceptualized and created for this event and mixed with curated designer items. Bold wall to wall carpeting, brushed gold laminate bars and custom made Italian leather couches were created to produce a unique environment, discover the full interior design strategy here. ITALIAN GOURMET BUFFET AND CATERING: Best in Class Italian caterers were chosen along with an exceptional ‘flying buffet’ menu featuring customised mixed-drinks, extensive welcome cocktail, main course and dessert buffets. Full menu details available. CUSTOM CAR REVEAL SHOW Unlike a traditional car reveal Genius Progetti produced a 6 minute custom animation using motion-capture technology of a choreographed piece created and inspired by the characteristics of the new car model. 9 Massive black screens were synchronized with a drammatic light show and soundscape to create a unified projection across 252 square metres of projection space using 18 high definition projectors hung on a full American rigging system.Two cars were revealed after the video screening using interactive production elements. 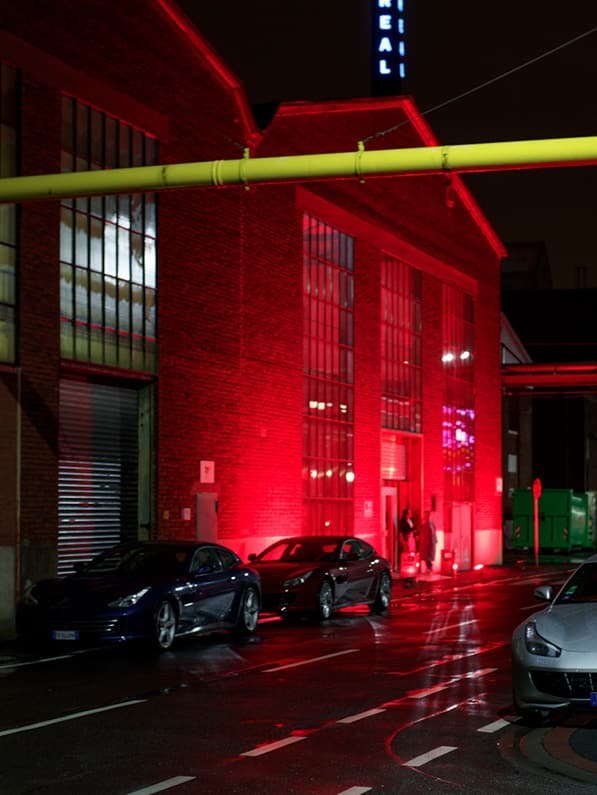 The first was revealed by opening a motorized wall from under the DJ booth and the second was revealed by hoisting one of the service bars to the ceiling to reveal the car hidden underneath. 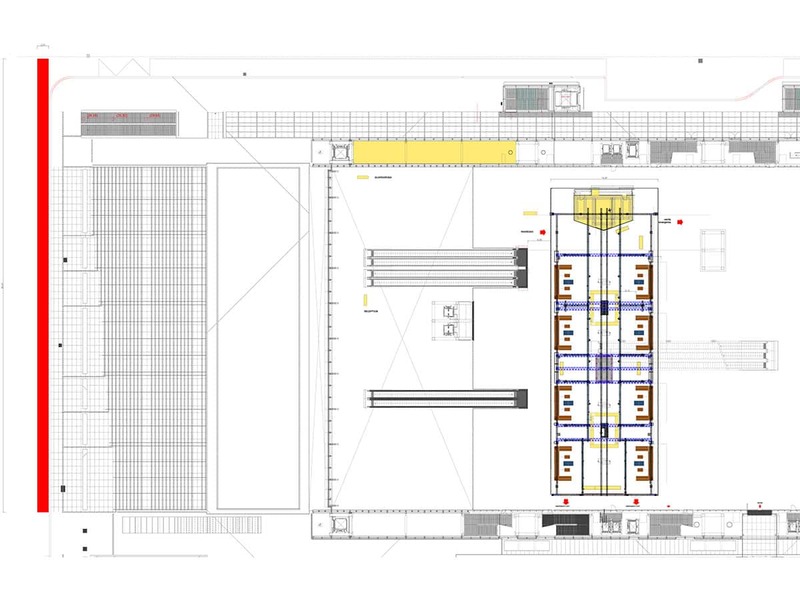 Technical Backstage and Tech Riser Areas for complete production management . Construction Staff, Riggers, Build Staff, Cleaning Staff, Security, Hosting Staff, Caterers, Parking Attendants etc. Client’s receive full 3-D renders in order to best plan the layout, mood and event concept during the Event Planning Phase. Our Technical Department conducts on-site evaluations of the space in order to gather all technical information for a complete and professional build. 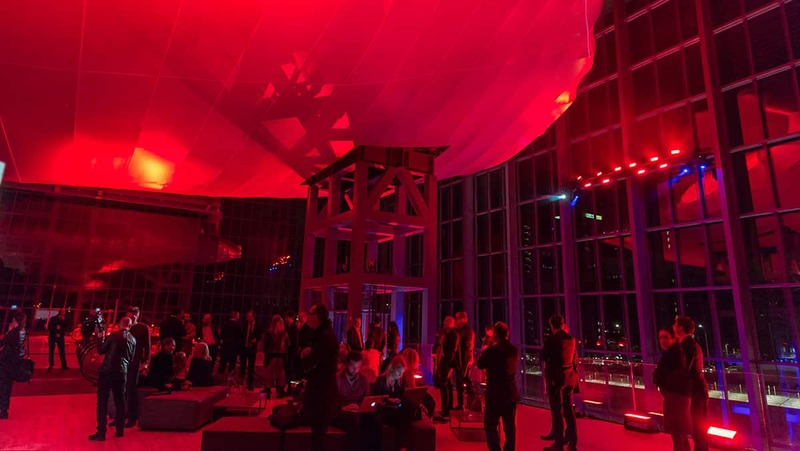 The lighting and interior design for this event highlighted the architechtural elements availble at this highly exclusive location. 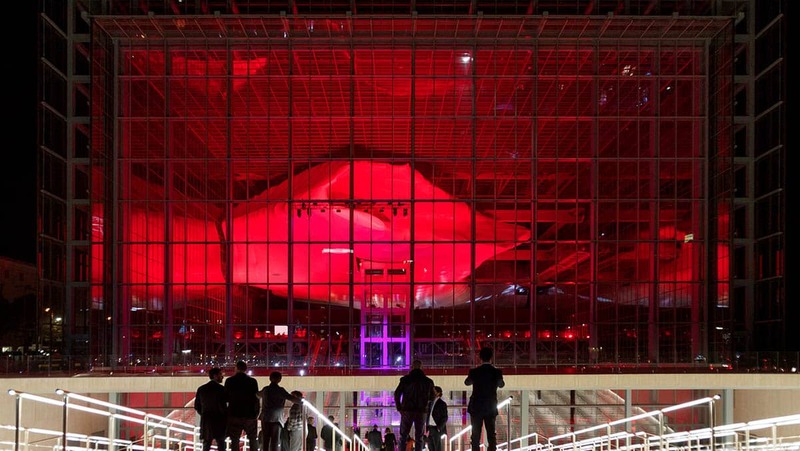 The Rome Convention Centre was lit to exalt the impressive cloud structure seen through the massive exterior windows. 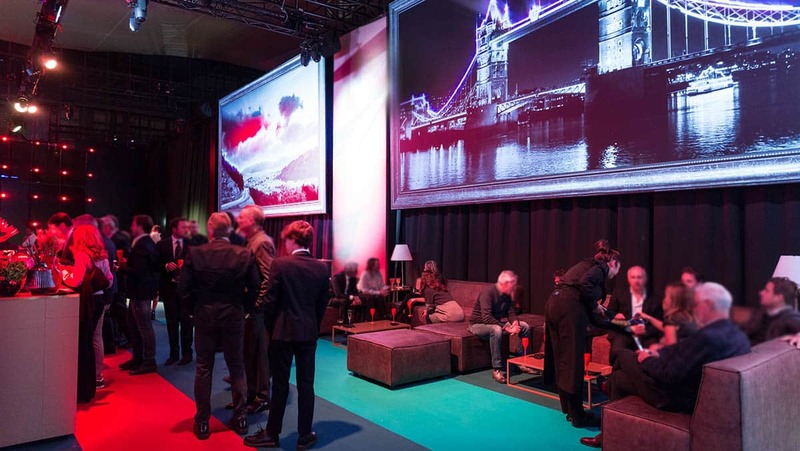 Due to the nature of the complex ‘black box’ production set-up, extensive technical checks and drawings were developed to ensure that the set build, car delivery and display and electrical requirements were adequate for each chosen location. We are an international agency and have accumulated 25 years of exhibition stand experience. We study your project brief in full to ensure that we deliver your design and functional objectives to give you maximum ROI on your exhibition investment. Our staff is also available to assist you in developing the concept of your project by guiding you through the brief process to ensure that your stand represents your brand and the message you want to convey. We know that your deadlines are tight so our competent and professional technical staff do their best to produce a stunning design in record time. The concept is transformed into a comprehensive project with high quality renders, 3-D imaging and a full technical layout for your to review. Genius Progetti excels at conveying the spirit of your brand and concept into dynamic, original and impressive exhibition stands that convey the essence of your brand. 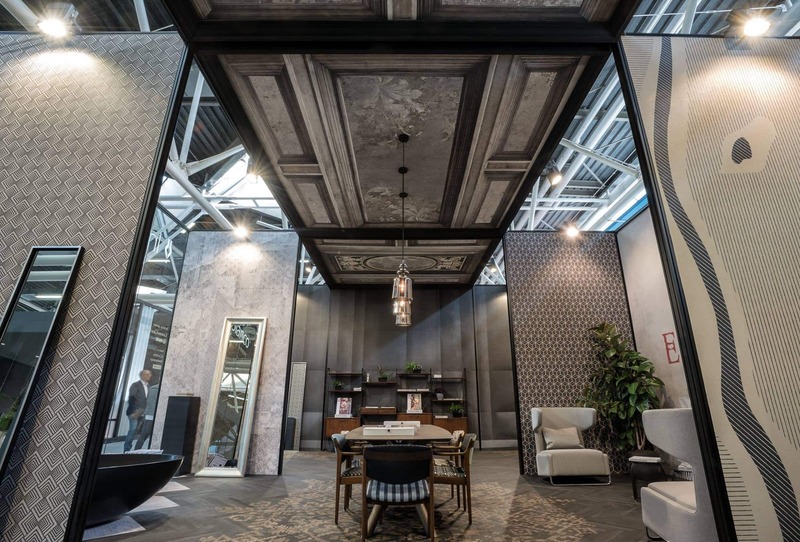 Genius Progetti has its roots in the development of exhibition stands with over two and a half decades serving some of the most prominent companies in the ceramics, medical, automotive and cosmetic industries. Our build and construction staff can create your event set up with precision and perfection in any situation . Genius Progetti is dedicated to every project we undertake. From 1994 to now, we’ve been trusted by our clients to create memorable spaces, events and experiences, here you can discover just a few of them created over the years. Is your company organising an event, preparing for a trade show or planning on launching a new product? We'd love to hear from you. Feel free to give us some details about what you are planning and request a meeting with Genius Progetti. Stay up to date with Genius Progetti. Sign up & receive news on upcoming international projects. Thank you for subscribing to our monthly newsletter, in the meantime feel free to follow us on our social networks.